The amazing thing about Nisa is that they always seem to have exactly what you want. Whether it is a tin of soup, some orange squash, or a packet of frozen peas, you can always find it there. So if you find that you need something at the last minute, you can rest assured that you’ll find it in Nisa. We all know what it’s like. You’ve got people round for coffee and need some chocolate digestives, or suddenly have an extra person for dinner and need some more ingredients. Nisa is the perfect place to pick up what you need – but what if you can’t get out of the house? Here at Pinga we can. Our Pinga Partners can grab what you need and bring it over to you in a blink of an eye. The process is really straightforward. Just quickly download our app, then tell us what you want, and one of our Pinga Partners will get back to you straight away. The details of your request will then be clarified, you can pay through the app and then they’ll nip round and pick it up for you. You don’t need to fill up your basket to spend a minimum amount with Pinga, just order exactly what you want, when you want, and have it delivered straight to you. Our Pinga Partners are ready to go and love helping. They are trusted and reliable and will get your Nisa request to you quickly and with care. If you want something picked up from another shop, that’s absolutely fine too! Actually, we love that, so just put your request through and our Pinga Partners will pick it up and bring it round. We’re always here to help at Pinga and would really love to have you here with us. To get started today, here’s a closer look at our service and how everything works. Pinga delivers any items from Nisa today. 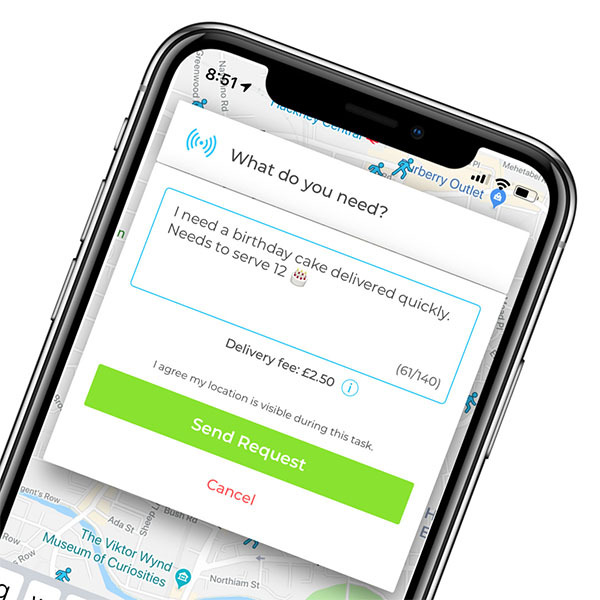 Infact our service normally delivers within an hour, so if you’re looking for same day delivers from Nisa, send your request via the Pinga App. Describe what items you needs to be delivered from Nisa and send your request. Pay securely within the app and receive your Nisa items to your door!